Most people would love a grand piano sitting at home, but it’s not always affordable or wise. There is a time and a place for everything, that is possibly why a smaller piano option to start a toddlers learning curve is a better idea rather than a full sized piano. There are some great piano instruments reviewed here and we compare each one, and hopefully get your toddler or child on their way to learning to become a great pianist. There are some general rules around getting toddler piano. Generally, the focus is more about getting them used to playing keys, hearing tones, feeling frets and thinking musically, which is ideal at such a young stage in their life and piano playing development. Matching Age with Capacity – A toddler is between 1 to 3 years and the capacity of a 1 year old is different from a 3 year old, so making sure you appropriately choose the right piano that suits there own development stage is crucial. The Right Size of Piano – Each piano has a slightly different size and dimension, which suits a particular toddler and their height, finger-span and ability to move around comfortably around the piano. This review offers an appropriate age range and sizes, as to make sure that you can choose the right size piano for your child. How Many Keys – There are loads of types of pianos and how many piano-keys to get for your toddler’s piano? Well, there are pianos with as little as 15 keys all the way up to the grand piano, which has 88 weighted keys. The full-sized piano might not feel right, but my point here is that there is an appropriate type of piano with an appropriate number of keys, which should come down to their overall capabilities. Apps and Features – There are some great features with some of the latest toddler designed pianos, which have built-in sounds, songs which help them distinguish tones and sounds. Some pianos even light up to naturally show the chord progression and make learning loads of fun and easy. Some pianos come with a mic and if your child is a singer then they can begin to sing their little hearts out whilst learning to play the piano. What Price is right – There is usually 3 or 4 times the difference in price from the lowest to highest and choosing the right ones is really down to personal choice, but ideally make a purchase with one you don’t mind them playing once and never again. This is impossible, but this is usually my advice to young parents making these can of challenging decision. This toddlers piano is slightly different from the last and offers a very different experience both in sound and touch. The designer’s intention is to produce a similar sounding piano as the orchestra sounding piano but without the overwhelming size and complexity, which would bedazzle most children. The 25 inbuilt sounds to help learn distinguished tones, makes for assimilation and learning super-simple for the young eager pianist. The demo songs that come built-in make for easy listening for everyone around, because they have been chosen for enjoyment and pleasure. This can be used with batteries and extremely portable for those who need one to take round to friends for children’s practice parties. The piano has a headphone jack and allows for easy listening for those wanting a rest from the practicing, which can become annoying, to say the least, especially with siblings close by. 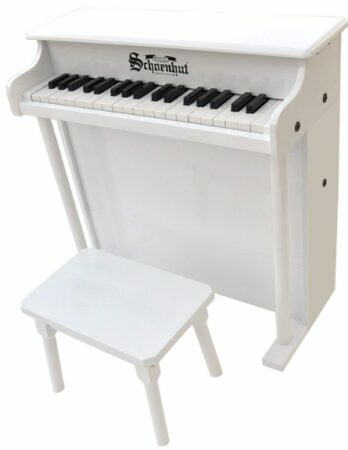 This toddler piano features 37 keys, both black and white, enabling a wide range of songs to be played. It can play drum sounds, animal sounds and also offers 8 different rhythms such as rock, samba and disco. This is great for kids to experiment with different styles of music. The keyboard comes with a stool for toddlers to sit at whilst they play. It also features a microphone for children to sing their favorite songs into. The bright colors make this keyboard appealing to young children – it is sure to keep them interested for long periods of time. It has loads of fun features and is great for helping young kids start learning to play piano. They will have years of enjoyment with this fun musical toy. 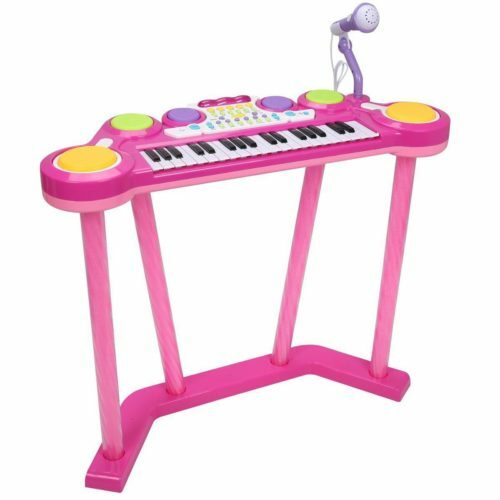 This is a girl’s pink toddler piano and comes with 25 key tabletop, which would make an ideal beginning for a young lady wanting to learn the piano. 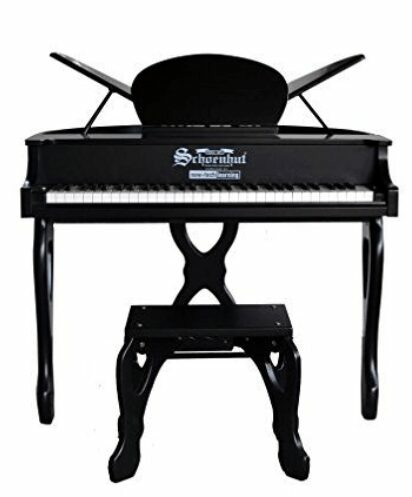 Schoenhut has been making pianos for over 100 years and this can really be felt with the life-like polished sound and quality of this toddler piano. The play by color makes this very easy for beginners and fun all at the same time, so they can adjust their little fingers to the chords. The learning system and design have made this a great choice for any daughter or grandchild birthday or Christmas. As you can see this kids piano is ideal for a toddler and would be a perfect gift for any birthday. This adorable little piano is easy to set-up and uses with a safety hinge to ensure child safety. This piano comes with a bench and the height is perfect for toddlers to sit for hours on end practicing on the keyboard their new favorite songs. This even comes with a music rack for when they get used to playing from reading a song. The 37 hand-tune keys are an ideal span for a toddler to use and make for easy playing. 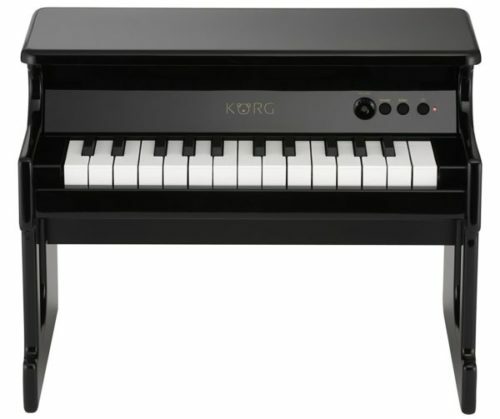 This type of piano is for beginners and doesn’t offer the full range of notes that other full-size pianos do, however, this is not a problem early on in their learning process. This cute piano comes with a color-coded chart to make learning more dynamic and suitable for young children. The songbook included is designed for making learning an easy transition from never before seen musical charts. This 4 legged piano is sturdy and will not be easily dislodged from the upright position for those worried parents. Those parents will be happy to hear this is made in the USA and comes with guarantees. This is suitable for ages from 4 to 6 and the pianos dimensions are 24 across, weighing only 32 pounds in total, which makes for easy handling. This 61 key digital butterfly piano is ideal for children aged 6 to 12 years old, but if your child is an early developer then this might be a good choice. The great thing about the butterfly baby grand piano is it mimics the sound of a real piano and does this because it’s digital. There are loads of options to choose from and your child can explore multiple sounds and features, like the organ or harp for example. Your child will have the ability to record and playback their recent efforts and will with time learn to improve their ability. This really is a great choice and is reasonably priced if you are a parent who is really considering getting your child into learning the piano. 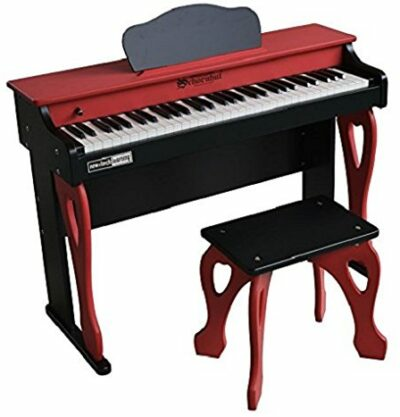 This bright and brilliant piano is a stand out in any playroom and offers a wooden structure with a sturdy design. The 25 keys offer a nice range of sound and the 2 full octaves make for a large variation in play. The illustrated songbook makes learning to play really easy. The color-coded keys add to this and allows for a natural transition from a child into a teenager, so soon they will be asking for that piano upgrade. 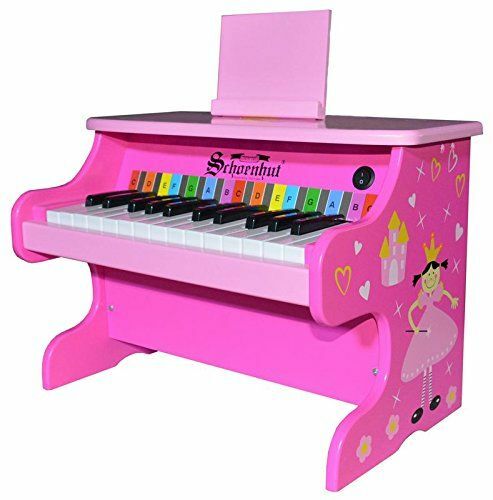 Some children need a nudge to play and with this brightly colored piano, the fun is injected into learning, which is essential for those kids that need a little motivation early in their pianist’s career. This is smaller than some of the others in this review and will be easily transported for those wishing to take it to others friends and families homes. This toddler piano has won various awards and is another great choice for parents wanting to give their child the best start. 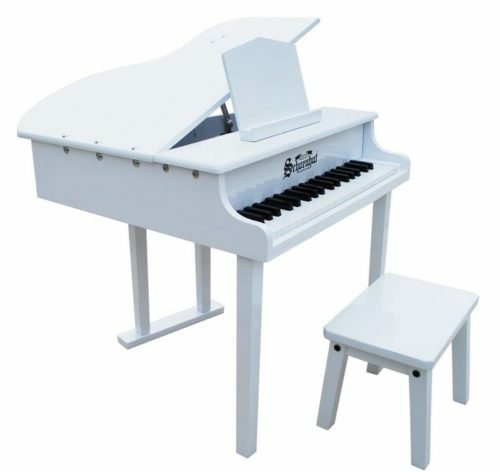 The white piano won the Dr. Toy best classic toy award in 2003 and in 2005 is was named the creative toy of the year by Child magazine. The design is elegant and simple, but not lacking in sophistication. The material is made of maple birch and the dimension is ideal for a toddlers room. the weight is 17 pounds which is light enough where it can be moved, but not too much so it can easily topple over. 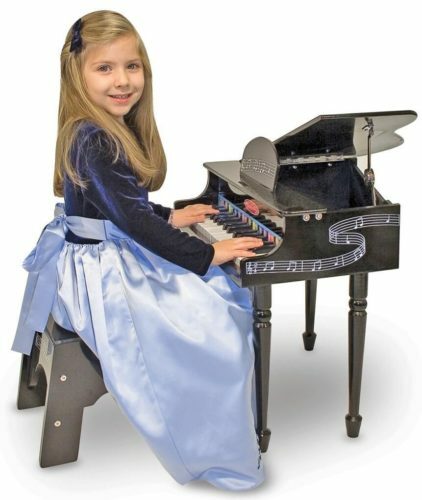 This unique looking child’s grand piano is different from the others for the simple reason it has a microphone which can record and playback for those little stars wanting to be heard. This to me is an awesome feature and makes for a good user experience and gets them into the mindset of perfecting their performance and making beauty through continual progress. There are 37 tuned keys and although electrical the sound quality is close to the real thing. There are lights which flash red to ensure the child can use with a different mode, which helps from an educational standpoint and will help with learning and processing. I like the fact it has automatic shutdown features and lessens the waste of batteries. I have had toys in the past work for one day and then need replaces, which is super annoying and made me and my child upset. This German style of piano is ideal for children who want precision and with the chromatically precise hammers, the sound will give the pianist a lifelike sound, which is ideal for them as they begin and progress onward and upwards. The key size of this piano is life-like and great for training their small fingers, which need to be able to begin stretching and feeling their way around the real sized pianos which will eventually come. There are removable color strips that can be used for helping to learn the structure of music. Schoenhut’s is an extremely well-made piano and is well-known as one of the best because of the German manufacturing process, which is renowned for high quality and life-like sounds. The mini grand piano is a life-like design and looks beautiful to those who like their child’s play-room to stand out as a place of learning and fun. The 20 keys with glossy and hand finished touch is great for playing and learning how to transition onto a larger life-sized piano. The elegant and unique design is a favorite of mine because it reminds me of my own playing past. 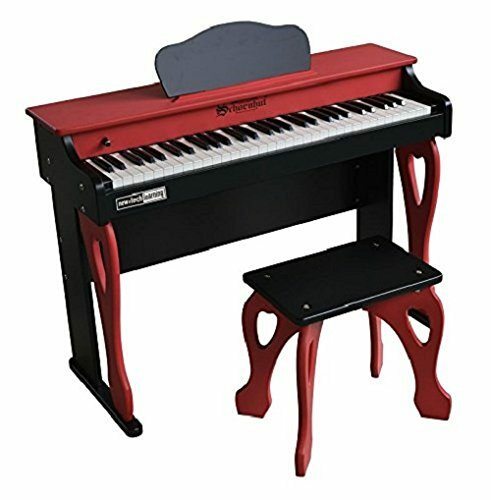 This child’s piano comes with a stool and is designed for ideal sitting and playing for hours at a time, which some others don’t offer, which means the children end up playing whilst sitting on the floor and that can be a deterring factor for wanting to play. This hardwood is sturdy and makes for great playing, so you’ll never have to worry about one leg breaking or something structural becoming broken, it’s built to last. 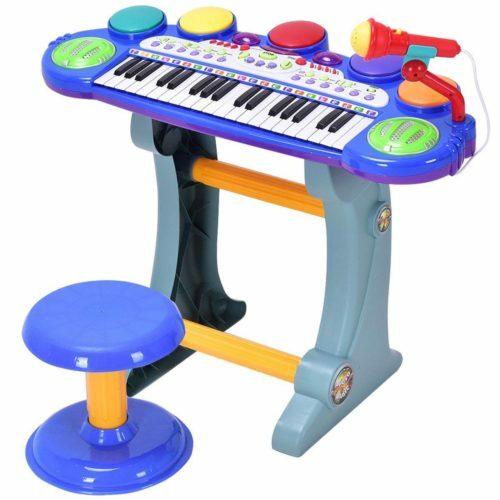 This is a great electric keyboard for children who want to play for fun or who want to learn to play properly.It has 3 different modes, including one which helps teach kids to play. The keyboard can play the sounds of 8 different instruments, making it great for developing musical awareness. The piano keyboard is a great choice for toddlers as it features interactive animals which move along to the music – little ones will love to see this! The keyboard also comes with a microphone for children to sing karaoke as they play. The keyboard can be detached from the stand, meaning it can be used anywhere – this is also ideal for traveling or transporting the keyboard. This cheap electronic keyboard is ideal for those who want something low cost but still full of fun features. It comes in a choice of two colors – either pink or blue and green. The keyboard has all the features you would expect on a much more expensive model. There are 8 different instrument sounds as well as 8 rhythms. 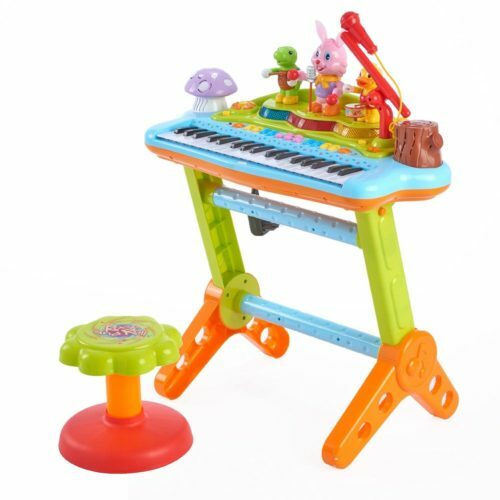 The toddler piano has MP3 connectivity, meaning PCs and phones can be linked up to the keyboard. The legs light up when playing, making the keyboard bright and interesting for younger children, too. Parents will love being able to power the keyboard either with a USB charger or with batteries – it can be used anywhere without having to rely on an outlet. 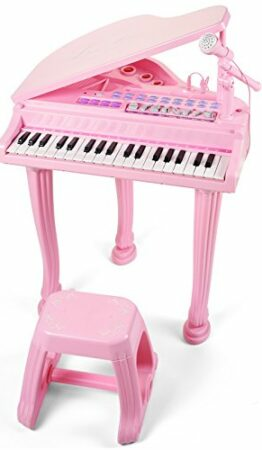 This beautiful pink toy grand piano is ideal for little girls who wish to learn to play piano. It features 37 keys with a realistic grand piano sound, meaning children can play a wide range of their favorite tunes. 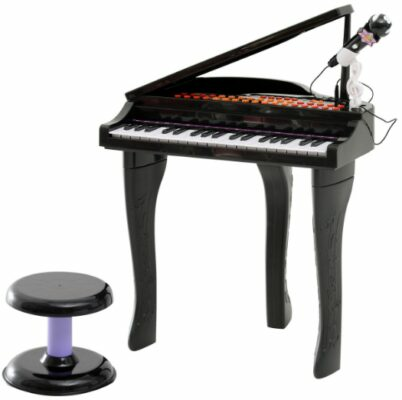 The piano also comes with a microphone and a stool, meaning children have everything they need to put on a performance! The toddler piano comes with an educational mode which helps teach kids how to play, by following red lights which appear on the keyboard. There are 22 built-in songs which can be played in this mode. The keyboard also has record and playback functions, meaning children can record their creations to listen to again. Parents will love the auto-sleep mode, for when little ones wander off and leave the toy switched on! The “Schoenhut Piano 6101B 61 Key Digital Butterfly” is a fantastic toddlers piano and ideal for them to begin their journey. The 61 built-in-key sounds and demo songs stand out as a great choice for getting them having fun, learning and exploring the concepts of the piano. Compared to the other pianos this is highly rated both from me and other parents who have expressed its superior sound quality, portability and durability. This is made to last them until they are ready for progressing onto the acoustic, digital or keyboard piano. 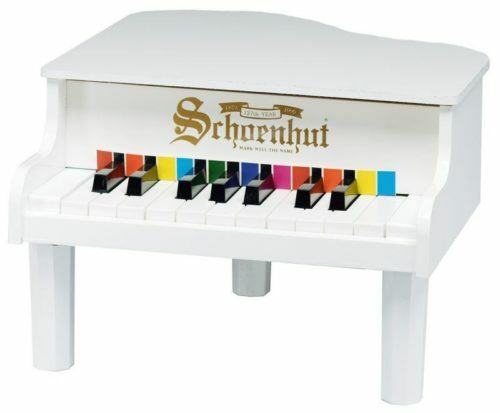 The Schoenhut piano is a great colorful low-budget pick compared with some of the others with a solid wooden design, which comes with an illustrated book to sing along to and with 25 keys the easy to play piano is a great toddler pick at a low price that won’t be regretted.